For one reason or another, you may find yourself suffering financially at some point in life. 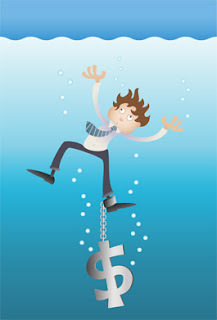 When you feel like you're sinking in finances that you can’t keep on top off, it can be overwhelming. But it doesn’t mean that you have to face them alone or accept that your situation will be the same for life. Instead, you can make a change and turn your financial life around. Whether you’re not earning enough or spending too much, the first thing you need to do is work everything out, and then you start to take action. As soon as you realize that you’re in a bit of financial pickle, you’re going to want to do what you can to get out of it. But the first step towards making that happen is to look at your finances in terms of what you spend. You may think you know where your money goes, but you can be surprised when you look into it. So you need to look at all of your expenditure. That way, you can work out how much you spend each month in order to cut it down. Now that you know where your money is going, you can start to think about saving money on your monthly expenses. Firstly, you can weed out any of the unnecessary expenses that you have, like coffee or eating out too much. Then, you’re going to want to look at your monthly bills to see if you can reduce them too. From TV subscriptions to car payments, is there a way that you can reduce the amount you pay? You’re going to want to speak to each company to find out. When you start to save money on what you’re spending each month, you could be getting yourself into less debt, especially if your monthly expenditure is now under your monthly salary. But, if you are in debt, no matter how big or small it may be, you’re going to want to start getting that down - especially if you want to save for old age anytime soon. Start by paying off debts with the highest interest rate and keep going until they are all gone - whether it take two months or two years. Next up, whenever you find that you have some money to spare, you’re going to want to make sure that you can save a bit of money for a rainy day. You might even want to speak to a financial advisor at this point, just to see if you can find a savings options that suits your needs. With lower expenses and no debt, the savings world will be your oyster. However, even you do manage to get back control of your finances and start to save; you should still be very conscious of what you’re spending and what money you have. If you have struggled in the past, you could struggle again - regardless of how much money you earn in the future.